Since 1924, the Community Foundation for Greater Buffalo has been awarding scholarships to students from Western New York. In 2018, the Community Foundation was one of the region’s largest scholarship providers, awarding scholarships totaling $2.6 million to Western New York students. Have been accepted to a nonprofit, United States Department of Education accredited school for full-time, undergraduate study. A very limited number are available for graduate students in the fields of architecture, arts, engineering, medicine, nursing, piano, environment and wildlife. Text “Scholarship” to (716) 259-2499 to sign up for texting alerts. Click here to download our Frequently Asked Questions Flyer. Click here to download our Scholarship Announcement Poster. Are you a member of a Scholarship Selection Committee? Please click here. Are grades a factor in determining awards? Yes. To qualify you must have a minimum “C” or a 2.0 (on a 4.0 system) G.P.A. average or greater. No. All grades should be uploaded with the application. High school students should upload a copy of the current report card showing at least two marking periods. College students should upload a copy of their most current grade report, produced by their school or school’s website. What if I’m undecided between two schools? 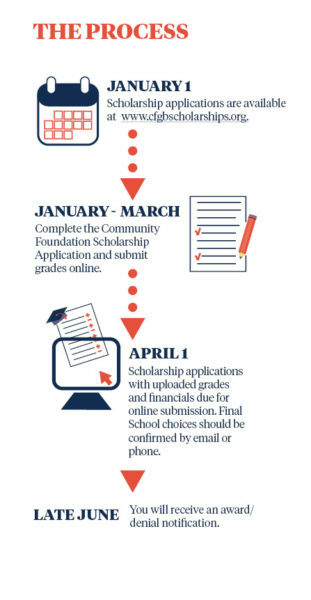 Please make sure financial packages for *both* schools are submitted and notify the Foundation of your final decision of college/university no later than April 1st in order to be considered for a scholarship award. If I attend school out of the area but my permanent address is local, do I qualify? Yes. As long as your permanent mailing address is within the eight counties of Western New York, you qualify for the scholarship (Allegany, Cattaraugus, Chautauqua, Erie, Genesee, Niagara, Orleans and Wyoming counties). What are the awards based on and what is the scholarship range? Awards are based primarily on financial need, although certain awards are also based on scholastic achievement, service or specific requirements. Awards range from approximately $1,000 to $6,000 – determined by the Foundation’s Board of Directors. Strong preference is given to those applicants who are Pell eligible as determined by the Free Application for Federal Student Aid (FAFSA) and attending school within the eight counties of Western New York. What determines unmet financial need? Your total college expenses minus your total resources. College expenses include: tuition and fees, room and board. Books, supplies and miscellaneous expenses can be considered up to $2,500. Resources include: other grants (Pell, SEOG, TAP, etc.) scholarships from other sources, and the Expected Family Contribution (EFC). What Financial Information is Required? You will need to upload your Student Aid Report (SAR) and the Award letter you received from all colleges you listed on your application. What if my financial package is not expected to be complete before the April 1st deadline? Tell your college/university financial aid office to submit information based on estimated amounts. After April 1st, the Foundation will not accept Unmet Need information. No exceptions. Will this scholarship cover Summer Terms? No. The scholarship is awarded based on the following: Fall and Spring full-time attendance for Semester schools. Fall, Winter and Spring full-time attendance for Trimester schools. No. Changing schools after the scholarship has been awarded *cancels* the scholarship. What areas are considered part of Western New York? The eight counties of: Allegany, Cattaraugus, Chautauqua, Erie, Genesee, Niagara, Orleans and Wyoming.